CAPITOL HILL. Wednesday, January 9, 2019— A longtime Ohio activist for justice and peace in Ireland is the latest recipient of the Irish American Peace Prize, instituted by the Irish National Caucus. Attorney Neil Conway of Cleveland was presented with the Prize on Monday, January 7, 2019, in Columbus, Ohio, following the World Peace Prize presentation to Ms.Pierrette “Petee” Talley, Ohio AFL-CIO—Secretary-Treasurer. Fr. Sean Mc Manus —president of the Capitol Hill-based Irish National Caucus, and Chief Judge of the World Peace Prize— made both presentations and the ceremony was Chaired by Barbara Flaherty, Executive Vice President, Irish National Caucus, and a Judge on the World Peace Prize Awarding Council. Neil Conway said: “I am deeply honored and flattered to receive the Irish American Peace Prize from the Irish National Caucus (INC), acknowledging their leadership’s dedication to peace, justice, and reconciliation in Ireland. The INC’s non-violent efforts helped bring an end to interrogation techniques— which amounted to torture — against detained and interned Irish citizens in violation of the European Convention of Human Rights and helped resist the practice of incarceration without being charged. The INC also exposed in the U.S. Congress collusion by British armed forces with outlawed Unionist/Loyalist paramilitaries. 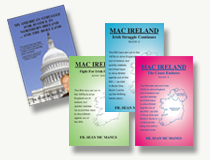 And, most notably, the INC’s signature campaign, the Mac Bride Principles, in effect, sounded the death knell to anti-Catholic discrimination by American companies in The North/Northern Ireland.” END.